Unique jewelry creations to fall in love with! ...ARE TRANSFORMED INTO BEAUTIFUL, HANDCRAFTED, ONE-OF-A-KIND DESIGNS IN WEARABLE ART, LIKE THESE. Other design materials may include Swarovski crystals, shells, & semi-precious gemstones. ...TO CREATE CAPTIVATING CHAINS SUCH AS THESE. Jump rings are added by hand...one at a time. Most popular request? Baby feet. Add birthstone colors or other touches to make it yours alone. Scroll down to see a few ideas. Visit Becky's Beach Glass Designs on Facebook to see more! 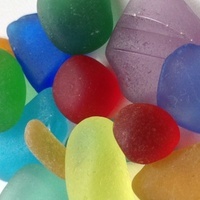 Becky's Beach Glass Designs offers an online shop stocked with a nice variety of the latest designs. See a style in the online shop that you'd like to make your own? You can feel confident that your purchase is backed by a solid guarantee of your happiness and satisfaction. Should you find an issue with an item that needs immediate attention, please contact me asap to discuss it and what available options we can apply to remedy it. It is most important that you love what you buy! I am confident that you will...and you have my word. I am a self-taught artist with very humble beginnings. My motivations for what I do today are the same as they were when I first began creating jewelry pieces for others. Simply put, I love the challenge it brings to design original, one-of-a-kind creations while making a stylish statement. It's both rewarding and satisfying to offer the level of style and craftsmanship that I am able to put into each piece. Please ask or do tell! It's easy to do with the form below. Thanks!